The purpose of the present article is to demonstrate the superiority of the APAS system over all the other systems. Overall, the APAS system out performed the other systems by a large margin. In the present report, each company was ranked according to the results. The company with the best results on a particular parameter, received 5 points, the next position received 4 points, and so on. The company with the worse result for this parameter received only 1 point. 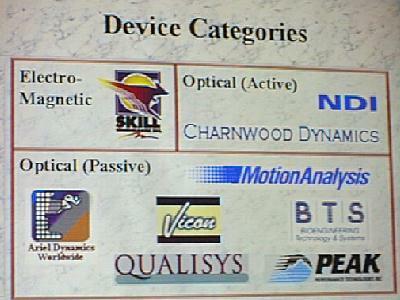 (There were 7 different company products that were tested. Only five of the seven were able to produce reliable results). Slide 9. Skill 6-D Summary. 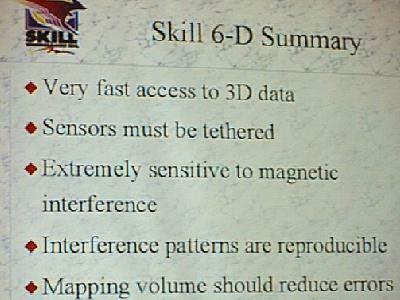 Slide 9 illustrates the Skill 6-D Summary as was presented at the conference. As one can see, this technology is still new and did not meet the required standards. This technology depends on the subject being hard wired to the sensors and is extremely sensitive to interference. This equipment does not allow data collection on the field and movement is limited to an area of approximately 3M only. Therefore, the present report did not include this technology in the rating. In the case of Peak and Vicon, markers crossed paths. The data presented at the conference reported only a subset of the data in which paths were correctly identified and this information was used for the analysis. In this case, the Peak and Vicon received only 1 point each while all the other companies that did not have this serious defect in their system received 3 points. The confusion of markers is considered as the most serious error in Movement Analysis Systems. 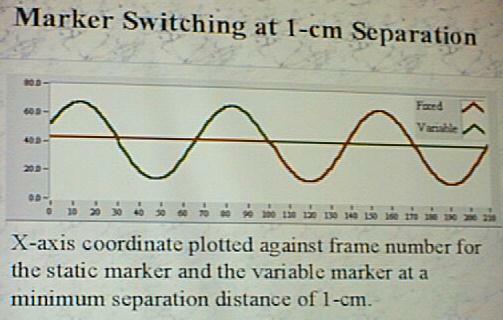 Slide 10 illustrates the serious problem that Peak and Vicon companies had with switching points. Once the points were switched, it was impossible to correct them. In the case of the APAS system, marker switching can never occur since the detection algorithm can maintain the marker identification at all times. Slide 10. Marker Switching occurred with the Peak and Vicon Systems. Generated on 4/25/2019 9:40:57 PM (PST) ADI/HQ/GBA/2019/ARIELCLOUD/v3.0.2018.0126.